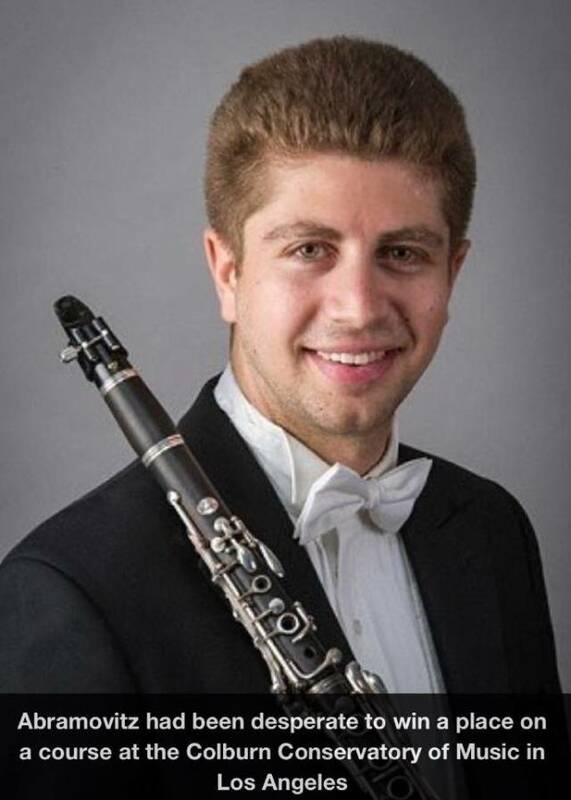 A clarinetist has been awarded $266,500 in damages after his girlfriend sabotaged his music career by deleting an email offering him a place at his dream school and then telling him he'd been rejected. 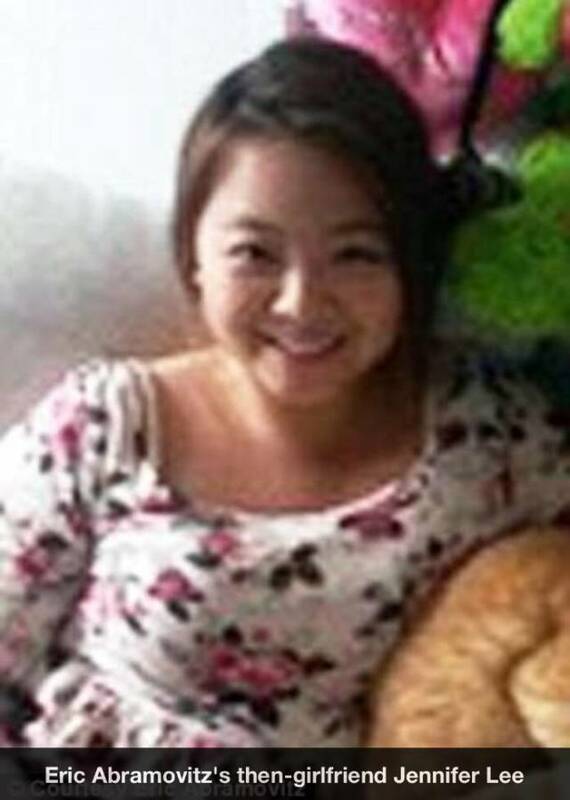 The motive for the deceit remains unclear but it appears Lee either wanted to avoid being separated from her boyfriend by distance or she wanted to stop him from going to the school, which she had attended and left mysteriously, for another reason. In 2014, Eric Abramovitz was 20 years old, dating flutist Jennifer Lee and both were studying music at McGill University in Montreal, Canada. 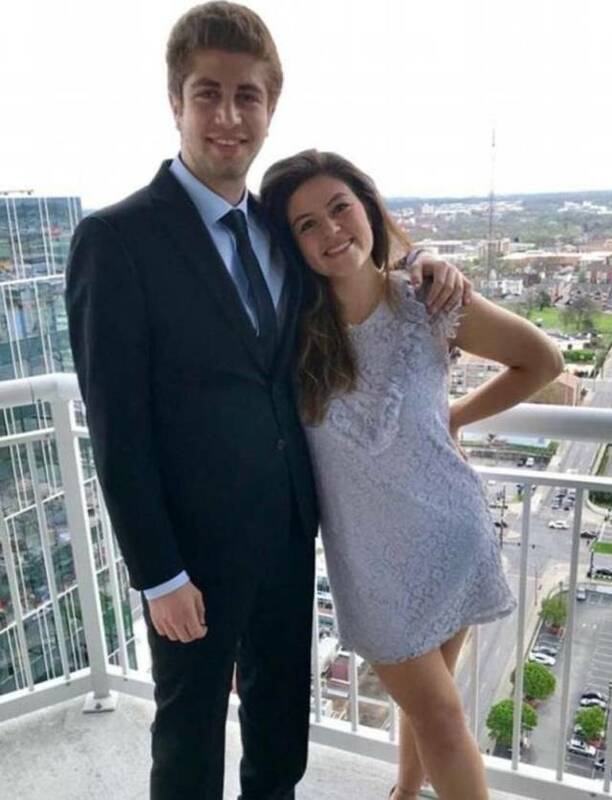 She had just transferred from the Colburn Conservatory of Music in Los Angeles, one of the country's most prestigious music programs, and he was a sophomore when they met in fall of 2013. 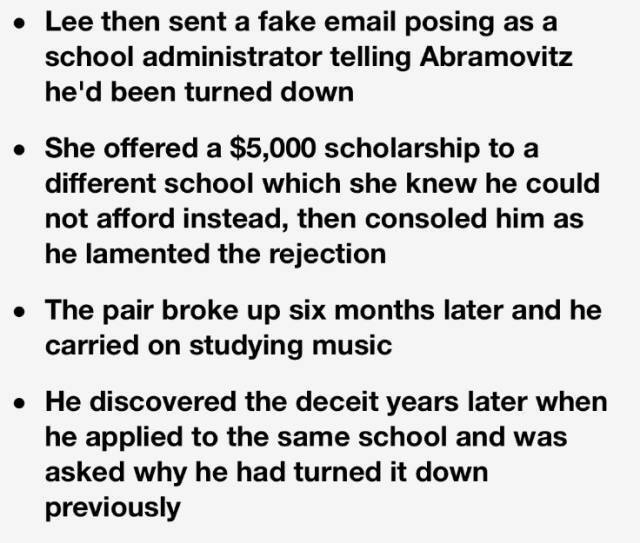 Lee spoke glowingly of the school she had left which, coincidentally, had always been on Abramovitz's bucket list. She told him she chose to leave because she wanted to be closer to her family in Ontario. After hearing her talk about it for several months, he decided to apply and, with her blessing, auditioned for a place in February 2014. He planned to stay with her despite the 2,900 mile distance, and never threatened to end their relationship if he got in. He was successful and was offered a full scholarship plus room and board, which is given to all of the students at the world renowned school. 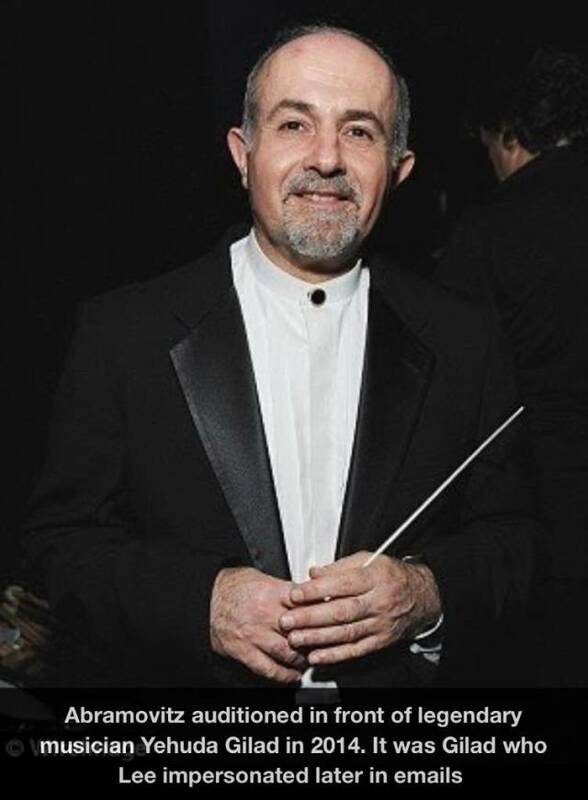 The offer was made by clarinet master Yehuda Gilad in an email which was sent to the young man's account but he never saw it because Lee intercepted it. Posing as her boyfriend, she then rejected the offer, responding that he would be 'elsewhere', and deleted the chain of correspondence. Then, she created a fake account in Gilad's name and sent her boyfriend a fake email which said he had not been successful. She offered him a fictitious partial scholarship to a different school which she knew he could not afford then consoled him in Canada as he got over the rejection. He does not know why she wanted to stop him from going and does not know whether it was because she did not want them to be apart or if there was something in Los Angeles she did not want him to discover. 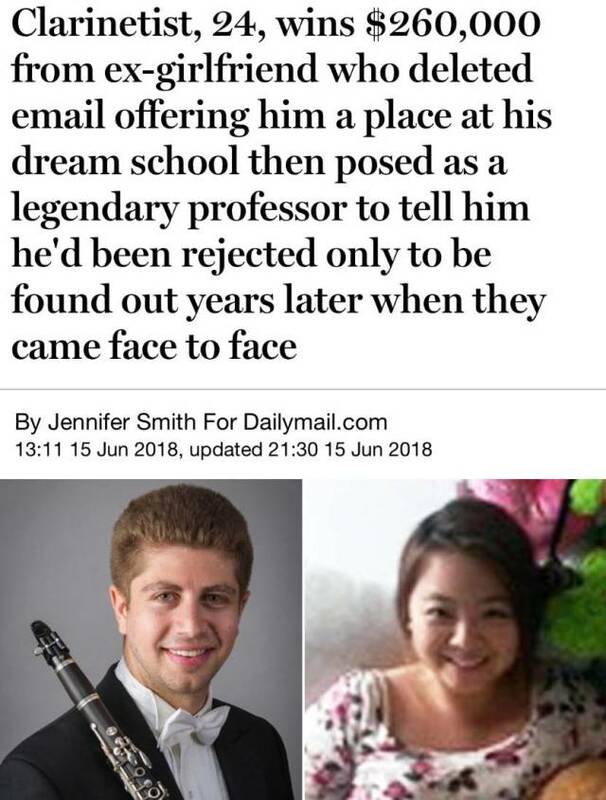 He told how their relationship was going well and said she seemed 'normal', if a little intense, when they began dating as 20-year-old music students. "She seemed relatively normal. We met in September 2013, we were both musical students. The relationship progressed quickly," he said. Abramovitz grew up in Montreal and spent his life dreaming of attending a prestigious school in the United States. Lee claimed to have left Colburn because she wanted to be near her family in Ontario. Having heard her talk about the L.A. school in length, Abramovitz decided that he would try to secure a spot and he does not remember her trying to talk him out of it and says she was 'neutral' about it. "She had been there, she was the one telling me how good a school it was initially. 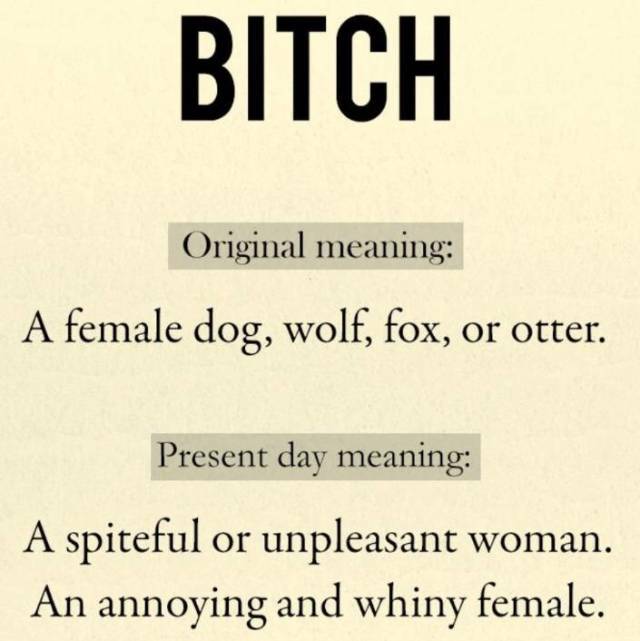 I don't remember much but she didn't have any bad things to say about it." They did not plan on breaking up despite the distance his move would have incurred and she stuck with him as he prepared endlessly for his all-important audition in February 2014. Abramovitz traveled to L.A. and performed for Gilad then made his way to Montreal to wait for the news. In April, he got an email from a gmail account which claimed to be Gilad, telling him he had not been successful. Instead, the sender offered him a place at the University of Southern California with a $5,000 scholarship. It meant tuition would have been $45,000 which he could not afford. Heartbroken to have been rejected by Colburn and not be able to afford the alternative, he stayed at McGill and let Lee comfort him. "I was very bummed out. I was pretty down. She was there consoling me and she seemed genuinely upset. I don't know how someone could do that," he said, knowing what he knows now. 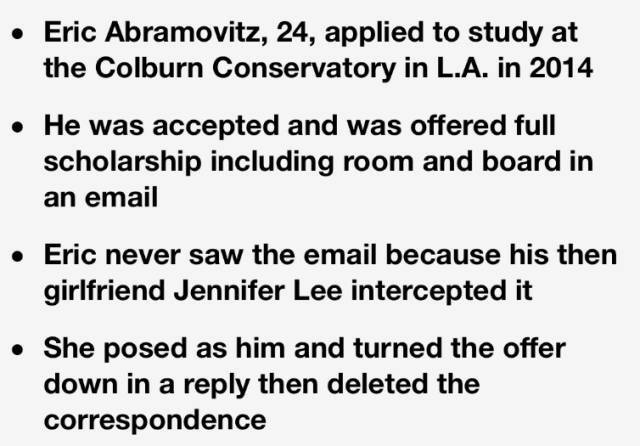 Before sending him the fictitious rejection email, Lee had used his laptop to turn down Colburn's email. She told them she would be 'elsewhere' and said she could not speak on the phone because it was broken. They carried on dating but broke up six months later for other reasons. On Friday, Abramovitz would not go into detail about her personality or why they split but said, looking back, there were 'warning signs' about her deceitful behavior. He has since discovered other alleged 'lies' she has told but would not go into detail about those either. The pair remained on amicable if awkward terms and carried on studying at McGill. In 2016, after graduating with his bachelor's degree, he decided to apply again for one of Gilad's schools. The goal was to land a spot and eventually be hired by an orchestra. In May 2016, he travelled again to California to audition. Afterwards, Gilad took him into a room and the pair had an excruciating exchange over the events two years earlier. 'I walked in and he said, "Why are you here? You rejected me.' I was taken aback and said, "With all due respect, you rejected me. 'Then he said, "No, you rejected me,' and I said, "You rejected me!" This went on a couple more times then the subject changed. I figured at that point that he must have confused me with another student,' Abramovitz said. He was not offered a spot at Colburn but took Gilad up on an offer to go to the University of Southern California, brushing off the back-and-forth they had in the interview after his audition. But when other students at USC began asking him why he had turned down the chance to study at Colburn, 'every musician's dream', he finally became suspicious of sabotage. With current and hopefully sane girlfriend. "For a while I just thought it was some computer-savvy clarinetist out there who wanted my demise. It's very difficult to hack someone's email account and create emails on their behalf, though, so I started thinking about who may have had access. She was the last person. We still saw each other every now and then and were on amicable terms at the time. I didn't think badly of her really, we were on fine terms, and she was the last person I thought was capable of doing something like this. Finally I started confronting the idea that maybe she could have done it. One night, me and my friend decided we were going to crack the case. I dug out the email I'd received from Gilad, sent it to him and he confirmed he had never seen the words or used that address before in his life. So my friend and I decided we would try to log into the gmail account." The pair attempted several passwords before trying a combination of letters and numbers he knew Lee often used for her own accounts. When it was accepted, they finally got access to the inbox and found his 2014 exchange was the only thing in the account. The back-up recovery email address belonged to her and the phone number attached to it was also hers. Abramovitz contacted her on Facebook to ask her about it and she denied it. When he presented her with the 'overwhelming evidence', he said she blocked him. A year later, he said she emailed him apologizing 'for everything' but offered no explanation for it. "She was more sorry about getting caught," he said, adding that the apology did not seem 'genuine'. In 2016, Abramovitz hired a lawyer to file a civil claim in court in Canada. He carried on studying in California and forgot somewhat about the ordeal until Wednesday when a judge ruled in his favor. As part of his lawsuit, Gilad submitted a statement calling Lee's actions 'immoral'. He said that it set Abramovitz's career back by two years and that he would have had the chance to earn around $150,000 in an orchestra if she hadn't interfered. "I am very frustrated that a highly talented musician like Eric was the victim of such an unthinkable, immoral act that delayed his progress and advancement as an up-and-coming young musician and delayed his embarking on a most promising career," he said. Lee did not respond to any of his lawyer's letters and defaulted in court which all but negates her chance to deny the allegations in Canada's courts. She now has to pay him $300,000 in damages and $50,000 in punitive damages for what a judge called 'despicable interference' in his career. 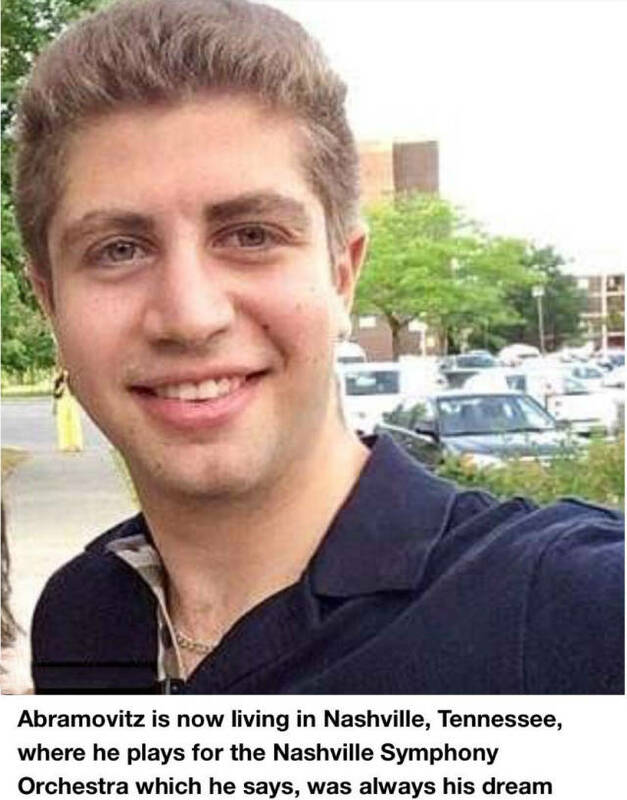 Abramovitz currently lives in Nashville, Tennessee, where he plays in a symphony orchestra and is in a new relationship with a student teacher. Despite his history with Lee, he is planning to go back to Canada shortly to be with his current girlfriend. Speaking of his new girlfriend, he said: 'She's normal, she's great. She's honest, from what I can tell. And she's not a musician, which is great,' he said.